It's Getting Steamy in Here! After months of me promising Steam would be coming to Linux, it's finally here. The early verdict: it's pretty great! The installer is a simple pre-packaged .deb file for Ubuntu (or Xubuntu in my case), and the user portion of the install looks very much like Windows or Macintosh. In my limited testing, I've found the Steam beta to be at least as stable as Desura. I also was impressed with the large number of my Steam games that have Linux versions ready to download and play. If you were under the impression that Steam was going to be the next Duke Nukem Forever, I'm happy to say that you (and I) were wrong. 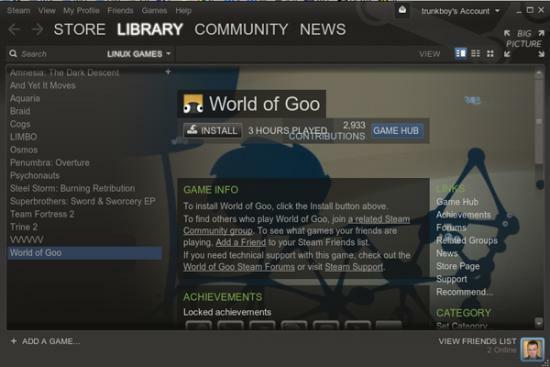 Steam has finally come to Linux, which has the potential to change the way Linux users play games. It also means fewer reboots into Windows just to shoot a few zombies! Check it out at www.steamforlinux.com.